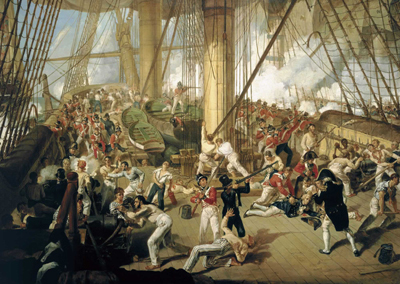 VICTORY AT TRAFALGAR FINALLY SANK NAPOLEON'S ASPIRATIONS OF AN INVASION OF ENGLAND, BUT COST NELSON HIS LIFE. HORATIO NELSON WAS AN EXCEPTIONALLY GIFTED NAVAL STRATEGIST. HRH PRINCE WILLIAM, ACCOMPANIED BY NELSON, TOOK PART IN A MASONIC STONE-LAYING CEREMONY IN PLYMOUTH IN 1787. Born in Burnham Thorpe, Norfolk, England, Horatio Nelson (1758-1805) is famous for his service as a naval flag officer in the Royal Navy, particularly in the early part of the Napoleonic Wars (1803-1815). As a commander, Nelson was noted for his inspirational leadership, superb understanding of strategy, and unconventional tactics, which resulted in a number of decisive victories at sea. He was injured in battle several times, losing an arm and the sight in one eye. Of his numerous victories, the best known and most noble is the 1805 Battle of Trafalgar, where his warships crushed a combined French and Spanish fleet. At the apogee of the action he was shot and morally wounded by a sniper from the mizzen mast of the French warship Redoutable. 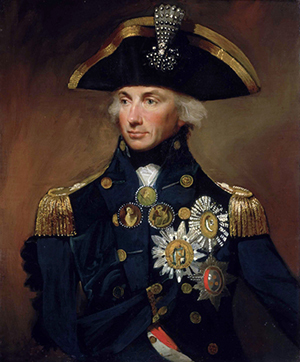 DURING A FAILED AMPHIBIOUS LANDING TO CAPTURE TENERIFE, REAR-ADMIRAL NELSON WAS SHOT THROUGH THE ARM. HIS NAVAL SURGEON LATER AMPUTATED THE MANGLED LIMB. WITHIN 30 MINUTES OF THIS, NELSON WAS ISSUING ORDERS TO HIS MEN! 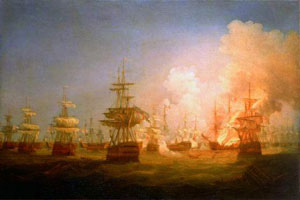 In 1801, Nelson was dispatched to the Baltic and won yet another victory, this time over the Danes at the Battle of Copenhagen. Napoleon Bonaparte had been threatening to invade Britain since 1798, ordering that hundreds of landing barges be constructed for the purpose, but he also required naval control of the English Channel. In 1805, Nelson took over the blockade of Cádiz where, finally, on 21st October 1805 the Franco-Spanish fleet came unwillingly out of port to be engaged by the Royal Navy off Cape Trafalgar. The allied enemy fleet was wrecked and with it sank any lingering hopes Napoleon may have harboured regarding a successful invasion of England. The battle was Britain's greatest naval victory, but bought at the cost of Nelson's life. His body was brought back to England where he was accorded a state funeral. 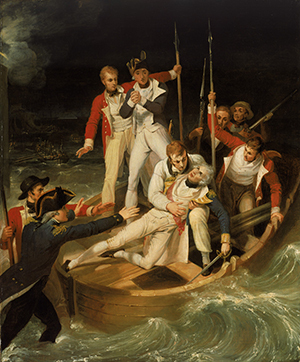 Nelson's death at Trafalgar secured his position as one of Britain's most heroic figures. Numerous monuments, including the iconic Nelson's Column in Trafalgar Square, London have been created in his honour and his legacy remains highly influential. An extraordinary achievement for a sailor who frequently suffered from chronic seasickness! For many years it had been thought that Lord Nelson was possibly not associated with Freemasonry, but painstaking research by John Hamill of the UGLE, London has revealed that he was. At a meeting held at the original Amphibious Lodge No. 407 in Stonehouse, Plymouth on the 15th August 1787 (a lodge for Royal Navy officers and marines) among the visitors is Bro. Nelson who had arrived back in Portsmouth, England from Nevis, in the Caribbean, on the 4th July 1787 aboard HMS Boreas. The Boreas paid off at Sheerness, West Yorkshire on 30th November 1787. Nevis is important as it was the island on which as a young sea captain, Horatio Nelson met and married his wife, Francis Nisbet, the young widow of a plantation owner. It is also known that, in 1787, Nelson was invited to Plymouth by HRH Prince William (later William IV, see Famous Freemasons M to Z) to witness a stone laying ceremony, with members of the Amphibious Lodge in attendance. Prince William had been made a Mason in Plymouth on 9th March 1786. THE BATTLE OF THE NILE TOOK PLACE AT NIGHT DURING WHICH THE FRENCH FLAGSHIP L'ORIENT BLEW UP, ILLUMINATING THE ACTION FOR MILES AROUND. 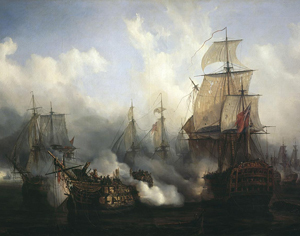 DURING THE HARD FOUGHT BATTLE OF TRAFALGAR THE FRANCO-SPANISH FLEET LOST 22 SHIPS. THE BRITISH LOST NONE. A writer in the Freemasons' Quarterly Review in 1839 claimed Nelson and his servant, Tom Allen, were Freemasons, but gives no evidence to support his claim. Hamon Le Strange, in his History of Freemasonry in Norfolk, says that among the furniture of the Lodge of Friendship No. 100, at Yarmouth, there is a stone bearing an inscription to Nelson. On one side of the stone is an inscription commemorating the foundation of the Lodge of United Friends No. 564 on 11th August 1697, and on the other side the inscription: "In Memory of Bro. V. Nelson of the Nile, and of Burnham Thorpe, in Norfolk, who lost his life in the army of Victory, in an engagement with ye Combin'd Fleets of France and Spain, off Cape Trafalgar, Oct. 21st, 1805. Proposed by Bro. John Cutlove." At the Masonic Hall, Reading, Berkshire may be seen a framed print with a representation of a banner carried at Lord Nelson's funeral. It bears the following words: "We rejoice with our Country but mourn our Brother." It was carried at the funeral by York Lodge No. 236.